Imagine the horror that you could face when you have relocated to a new place and when you unpack your packing boxes, you find your favourite vase or crockery shattered into pieces! Well, this could definitely happen if these items were not wrapped properly. Collision is bound to happen when goods are in transit or are being loaded or unloaded. Bubble wrap prevents all such collisions and breakages. Excellent quality of bubble wrap is known to lose only about 5% of thickness after a long time. So, buying bubble wraps is not a waste. You can use them later, when you want to store things. Also, after you are done with moving, you can use bubble wraps for insulation and they are known to be excellent protection for pests. The best part about bubble wraps is that it can be recycled. With so many of us taking a step towards the betterment of the environment and propagating recycling, bubble wrap is an excellent packing material. If you do not want to use the bubble wrap, all you can do is take it to a recycling centre and get some extra cash by selling it off! Well, what if you are moving from a place with high temperatures to a place with low temperatures or vice versa? Change of climatic conditions and temperatures is known to affect conditions of some goods. What bubble wrap does is, it protects these goods from humidity and other such climatic conditions which are known to spoil the materials. Sometimes electronic goods create statics. It is important that these goods are packaged with great caution. Using bubble foil is advisable as it is anti-static and protects goods from shocks and collisions. Electronic goods are well protected inside these sheets. These sheets are excellent adhesives. They cling to your goods and secure them well. However, the best part is, it does not leave any kind of marks or residue behind when you remove it from your goods. Cello tapes or other adhesives tend to leave marks on your items that are sometimes very difficult to get rid of. These sheets or rolls are easily obtainable. You can contact a moving company or any storage company. 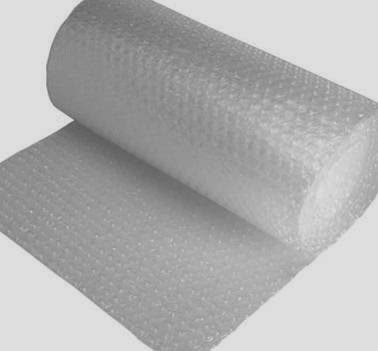 They have different types and sizes of bubble wraps to suit your requirements. These companies can guide you with the amount of sheets or rolls that you will need for all your possessions. Thus, bubble wrap is excellent for packaging. It is also cost effective and thus, saves a lot of money. Extremely durable and reusable, this is the best packing material that you can use for your goods.